Swimming lane ropes help keep swimmers in their lanes. When you are swimming competitively, lane lines help you stay away from other swimmers and can provide you with a clear lane without dealing with the draft from other swimmers. Swim lane lines for summer teams are the same as they are for any other competitive swimming, regardless of the time of year. However, summer can be a great time to replace your swimming lane ropes. Every pool is a different size. Some summer teams swim in shorter pools, while others use longer regulation pools. 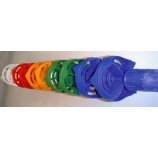 Regardless of which size your pool may be, you can find swim lane markers in a variety of lengths to accommodate. The Antiwave Forerunner comes in 25 and 50 meter lengths, as does the Competitor. However, the Competitor is also available in a 75 meter length, which is ideal for non-traditional longer pools. If you take a close look at a swimming lane rope, you will see it features alternating colors that help swimmers identify where they are in the pool as they swim. However, the exact colors don’t matter. When you purchase the Antiwave Forerunner or Competitor swim lane ropes, you can select to the colors of the markers to match your swim team colors. This allows you to customize your pool so everyone remembers where they are. You don’t always have to completely replace your swimming lane ropes at your summer team pool. Depending on the damage that has occurred, you may be able to use replacement parts. While it can be difficult to replace a few of the parts in your lane ropes, it becomes easier when you do it more often. These replacement parts will ensure you can continue to use your lane lines without spending more money on replacing the lines completely. Swim lane ropes are one of the most essential aspects of your pool when you use it for competitions. Whether you are in the market for new Antiwave Forerunner or Competitor lane lines, you will find a variety of lengths and marker colors from which you can choose. In addition to purchasing new swimming lane ropes, you may also keep some replacement parts on hand, allowing you to make minor fixes without replacing your ropes completely. If you need to replace your swim lane ropes or you need replacement parts, contact us. We carry everything you need in the best brands.